SYLLOGE OF COINS OF THE BRITISH ISLES. I. Fitzwilliam Museum, Cambridge. Part I. Ancient British and Anglo-Saxon Coins. By Philip Grierson. Published for the British Academy by Oxford University Press, London, 1958. pp. xxii + 70, including xxxii plates. 3 5s. 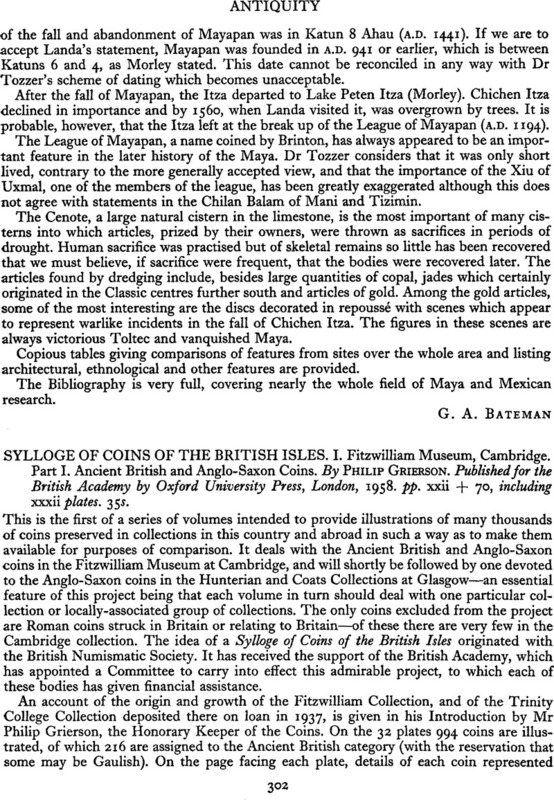 1 C. F. Keary and H. A. Grueber, Catalogue of English Coins in the British Museum, Anglo-Saxon Series, 2 vols., London, 1887–93. 2 Catalogue of British Seal-dies in the British Museum, London, British Museum, 1952, pp. 1–2, pl. I, 2a, 2b. 3 English Coins, 3rd ed., London, 1950.